This pack adds a total of 35 weapons to your inventory from the Global War on Terror. All weapons are in the "Coalition" and "Insurgent" catagories, as well as "stealth", "infantry support", and "underbarrel" when appropriate. This “Modern Assault Rifle” has been the mainline rifle of American forces for decades. 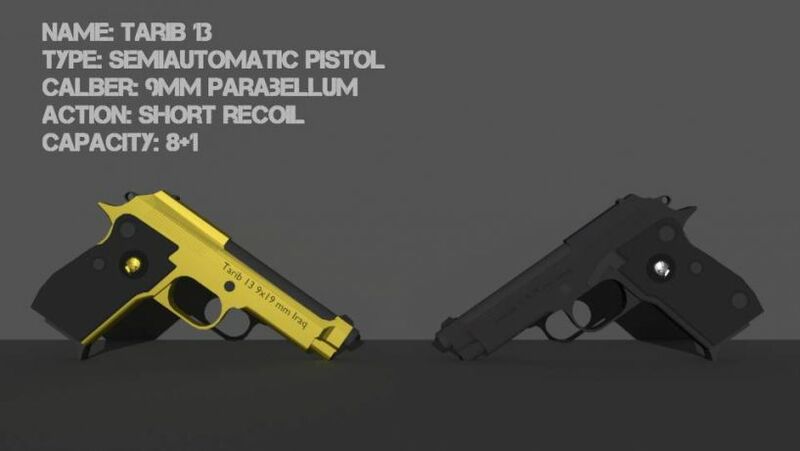 Originally introduced in Vietnam as the Patriot, the modern variant is more accurate and has a higher rate of fire. 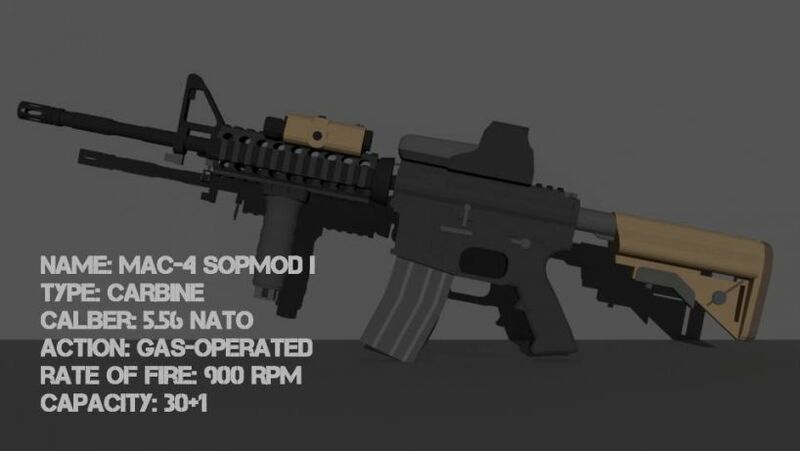 It is equipped with precision iron sights, a 30-round magazine, and utilizes burst fire. A standard MAR-16 equipped with a 4x ACOG and 40mm M202 grenade launcher, making it both effective against light vehicles, and a viable DMR. Its performance is effectively identical to the standard MAR-16 otherwise. 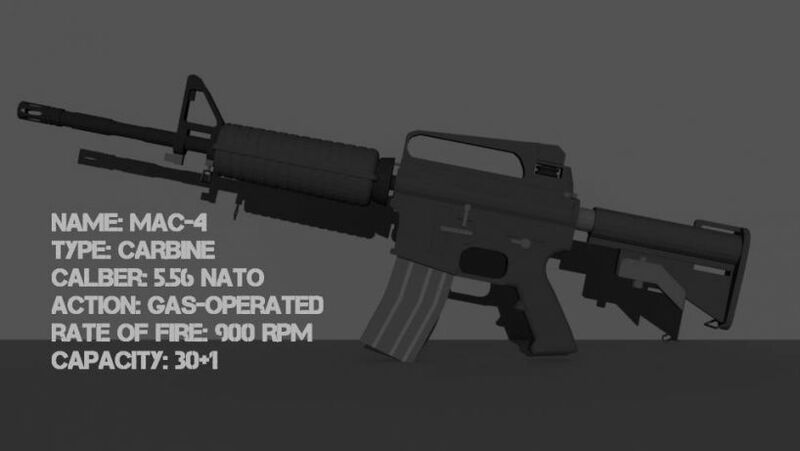 The shortened cousin of the MAR-16, the “Modern Automatic Carbine” fires at an impressive 900 RPM. This makes it an excellent close-range option, but sustained fire is highly inaccurate at range and magazines deplete quickly. 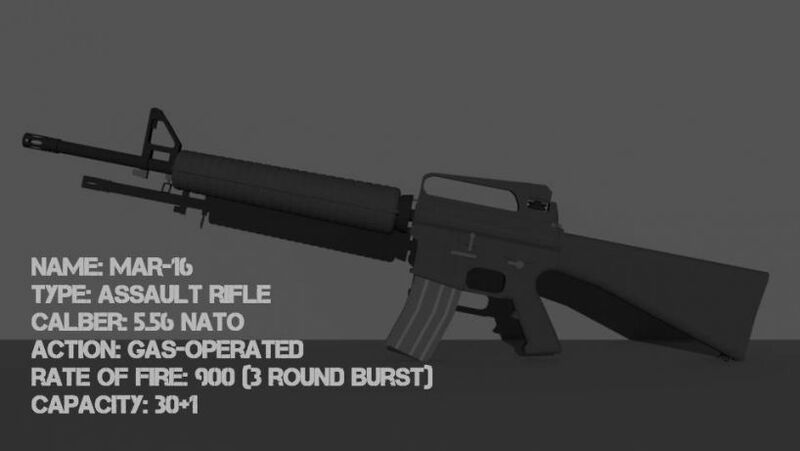 Ballistically it is identical to the MAR-16. Designed for a point-man, this variant of the MAC-4 is equipped with a 1x EoTech sight and an underslung 12-gauge shotgun. This weapon system is devastating in CQC. This MAC-4 has been decked out with attachments that greatly increase its combat effectiveness. It has less muzzle climb due to a vertical foregrip and the primary sight in now a 1x EoTech. 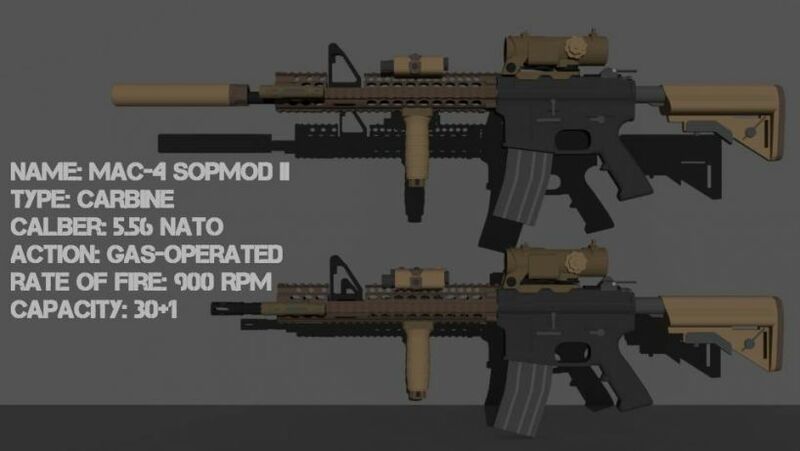 A further improvement to the base SOPMOD, this variant is primarily used by special operations. In addition to the foregrip, this weapon equips a 3.4x Spectre optic for mid-range shooting. Also available with a suppressor. 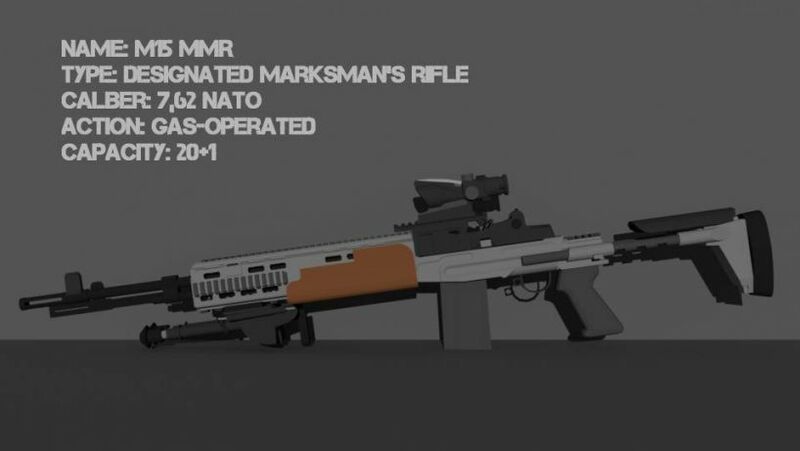 Designed specifically for close range combat, this variant of the MAR-16 family has a slightly reduced rate of fire of 705 RPM, more open iron sights, and a shortened barrel. A highly specialized modification of the Mk.44, this carbine is equipped with vertical foregrip, Aimpoint M2 red dot, and suppressor. It is excellent for stealth and special operations, shinning in close quarters, though still preforms respectably out to mid-range. 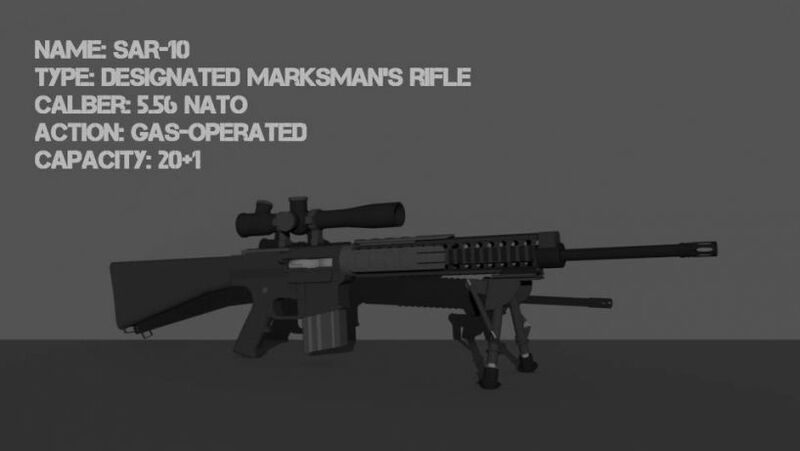 The Sniper, Automatic Rifle is based off the proven MAR platform and is designed for accuracy. It fires a more powerful 7.62mm round and feeds from a 20-round magazine. A heavy barrel, bipod, and high-powered scope make it a solid choice for a marksman rifle, however a crisp trigger allows for acceptable spray and pray close up. Though older than the Patriot, this battle rifle has returned as a marksman’s rifle. 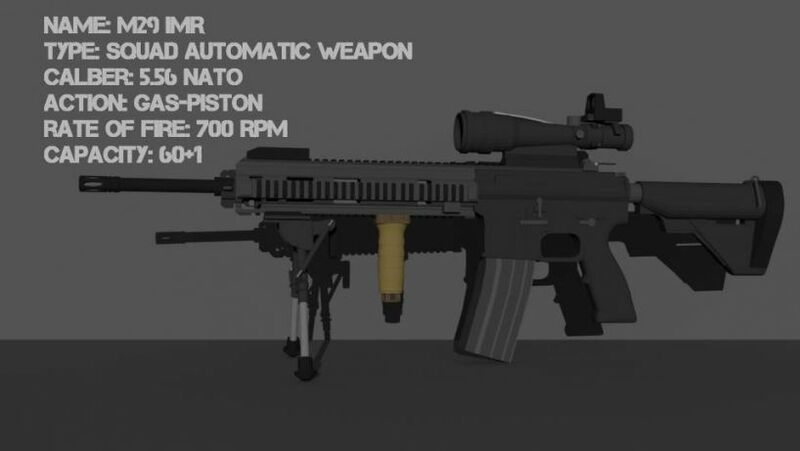 With a 4x ACOG and full power 7.62mm ammo, it fills a mid-range niche between the MAR-16 and SAR-10. 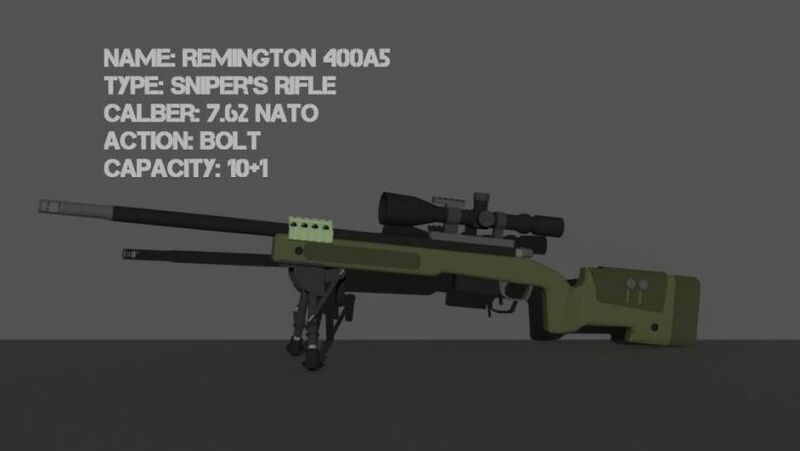 This battle-proven bolt action sniper rifle provides highly accurate firepower out to long range. With a high magnification scope, bipod, and precision construction, the R400A5 can easily nail targets beyond 800m. 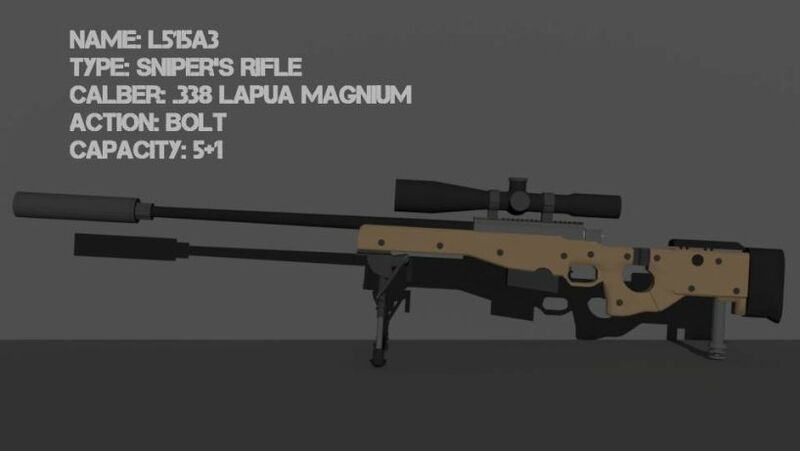 The British standard sniper rifle, this versatile and popular rifle is able to drop most targets with a single well aimed shot. What it lacks in capacity, it makes up for with near perfect accuracy and a flat shooting round as well as a suppressor. 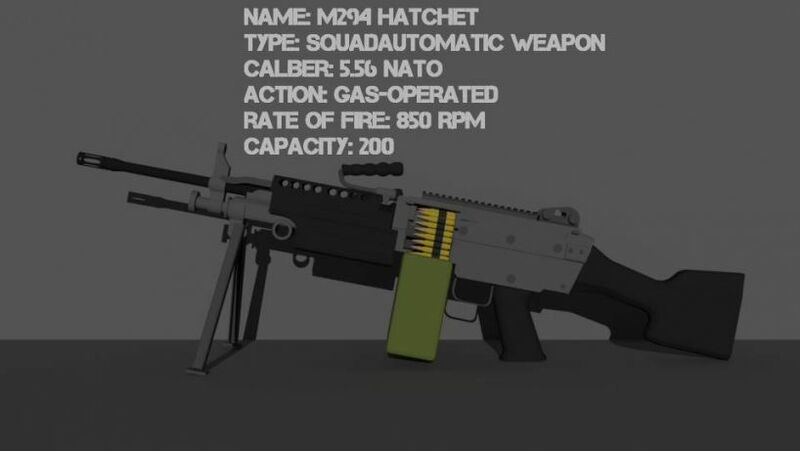 The M294 Hatchet is designed for sustained covering fire. 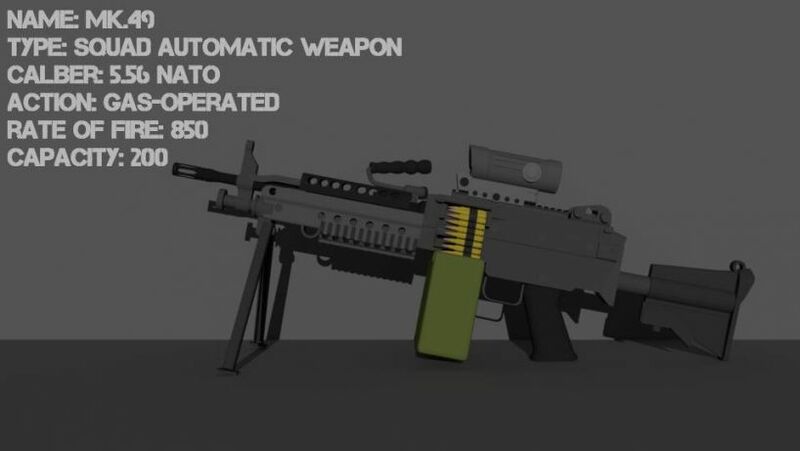 It accomplishes this task with a 200-round belt, heavy barrel to reduce heat, and fire rate of 850 RPM. However, reloads are very slow and accuracy quickly diminishes with sustained fire. This variant of the M294 is improved for special forces use. It is equipped with a collapsing carbine stock, 3.4x Spectre optic, and forward rail system. The Mk. 49 offers the same advantages and disadvantages as the Hatchet, though has better mid-range performance at the cost of close up reactiveness. Effectively unchanged since Vietnam, this grenade launcher fires a highly effective high explosive, fragmentation grenade that explodes on impact. It is devastating against infantry and lightly armored vehicles, though is effectively useless against heavy armor. Due to its low velocity and arcing trajectory, it can easily fire over obstacles. This pump action 12-guage shotgun feeds from a 5 round box magazine, making it an effective alternative to a standalone breaching shotgun. Due to its short barrel, it’s spread is significant, reducing its effective range dramatically. However, up close, it is almost always a one-shot-stop. 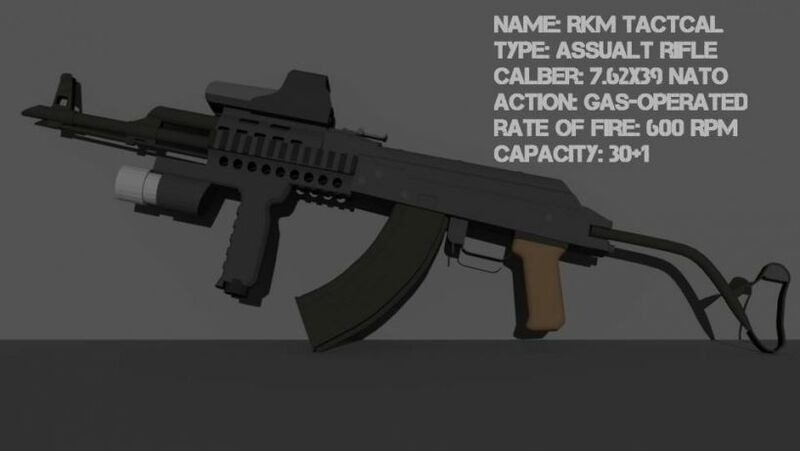 A ubiquitous assault rifle, this weapon is easy to maintain and highly effective. It boasts higher stopping power verses its American counterpart, though has higher recoil and lower accuracy. Reloads are also slightly faster at the cost of losing unfired rounds. Originally intended for paratroopers, this variant has a folding stock and integral foregrip, reducing muzzle climb. Otherwise, it is very similar to the RKM. This is a fairly uncommon variation on the RK platform, it is equipped with a side-folding stock, 1x EoTech optic, and surefire foregrip. This variant is by far the best close range option of the 7.62mm RK family. Much like its MAR-16 counterpart, this variant is equipped with an underslung PG-25 40mm grenade launcher. 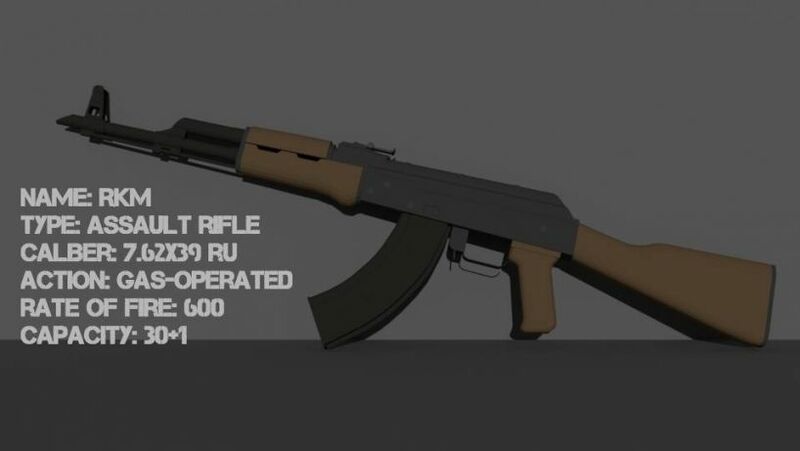 An evolution of the RK family, this rifle is chambered for the 5.45mm cartridge, affording it better controllability and accuracy at range, at the cost of reduced stopping power. 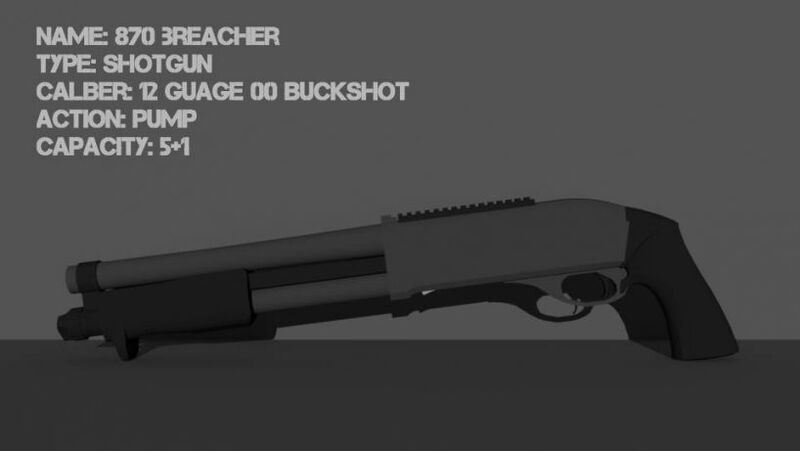 It also has a slightly higher rate of fire. Purpose built for close range fighting, this subcarbine fires at a respectable 735 RPM, great for hosing enemies close in. 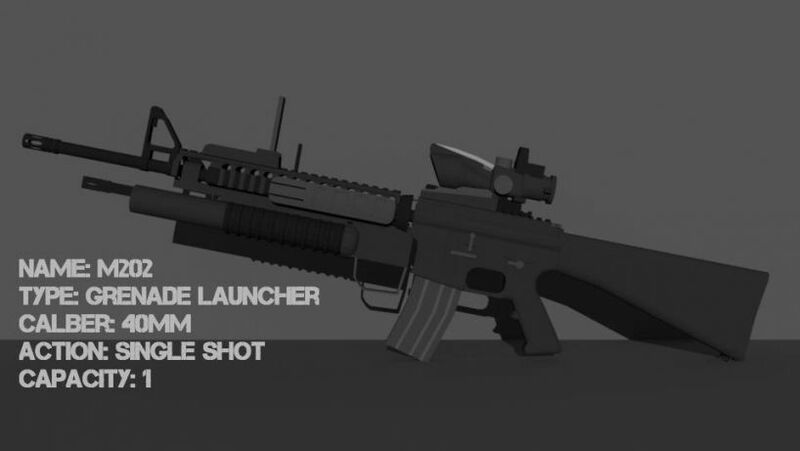 Due to its shortened barrel it has high muzzle climb, but short bursts are highly controllable. Designed for special forces, this weapon is suppressed and equipped with a Kobra red dot. It is excellent for clearing rooms, and can be pushed into the assault rifle role with tap firing at range. This muzzle loading, caseless 40mm grenade launcher fires high explosive grenades, able to take out multiple grouped enemies and even light vehicles with ease. It can also fire over barriers or indirectly to engage protected foes. A slight modernization to the standard Samozaryadny 43, this semiautomatic rifle feeds from a 20 round detachable box magazine and offers respectable accuracy. Also available as a DMR with a 4x PSO optic. A compact and effective machine pistol, this weapon is a great backup to a long-range weapon, or for clearing enemies close up. 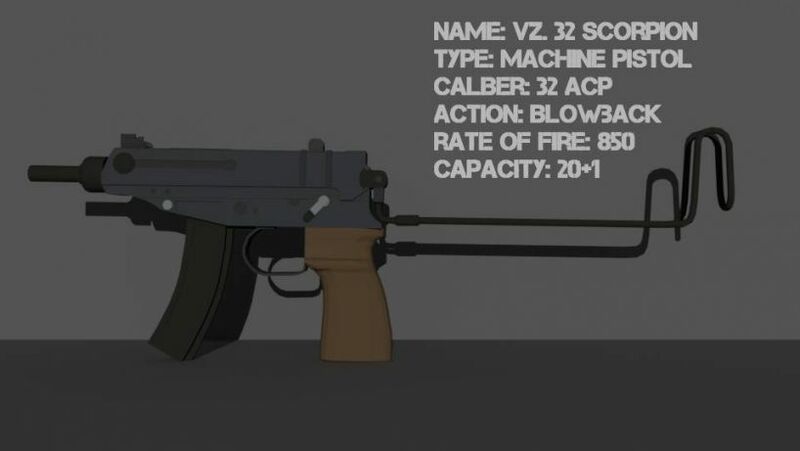 Though it fires a weak round, it is highly controllable and has a high rate of fire. Admittedly a rather crude copy of an Italian sidearm, this pistol is decent choice of sidearm. Also available gold plated if you want to show off to your comrades. As always, constructive criticism and feedback are greatly appreciated. 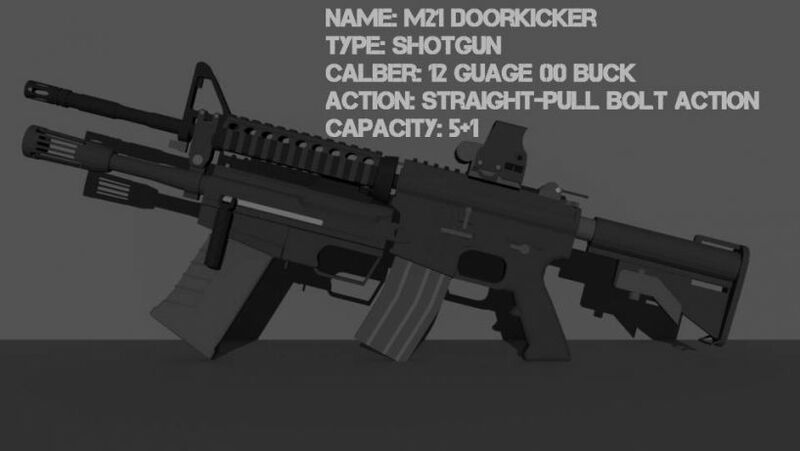 NOTE: To switch to the grenade launcher or M21 doorkicker, you must have it equipped in gear. While playing, press the '3', '4', or '5' key depending on what gear slot is assigned to. As of now the game does not have secondary fire, so this is the only way to set that up.